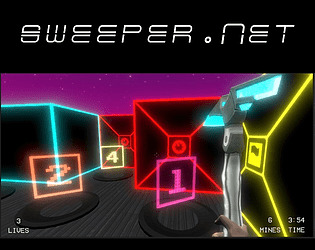 The classic minesweeper meets the first-person perspective. This is a prototype for a full game scheduled to be released in April of 2019. Press "H" in-game for Help. There is a total of 10 levels. Enjoy! I like the game and the hybrid theme, but personally I think the concept (i.e. minesweeper in 3D) is perhaps a bit too narrow. It isn't enough for me to want to play it over plain minesweeper. Personally (and maybe it's just me), I think it would be better if there were a somehow more advanced platforming aspect. Perhaps blocks rise and lower into lava - forcing you to move around while thinking? Just throwing ideas out there :). I will say the explosions are much better in this version than the tradition minesweepers. Overall the game played just like minesweeper does so nice job! It was a fun play. I hope you continue working on it and make it better. I would really appreciate if you gave my game a try. Interesting game! I also didn't know how to play minesweeper going into this, but I was able to learn it through playing this game. I think that, in addition to music, one improvement to the atmosphere of the game would be a background that fits with the theme (is it just me or is the skysphere in this rotated about 45 degrees?). I did a project a while back with a city in the same vibe as this game, all dark shapes and neon lights and strips running here and there, and I think something like that would serve as an excellent backdrop for this game. All in all, good job! Thank you for playing it and for the feedback. Really cool that this taught you how to play Minesweeper :). hey that's really cool actually :). I see you have an entry as well, I'll play it when I have some time. This game is, just ok. I really liked the graphics and the visuals. The colorful neons combined with those sci-fi looking pickaxes, make it look a bit cyberpunkish, which I personally think is a plus, and overall, looks nice. It actually creates a pretty cool atmosphere. The gameplay, well, it's just your regular minesweeper, except it is in first person perspective. This might not sound very promising, but it turns out, that it's actually a good combination, and a fun one at that! I do like the addition of lives, so that if you fail and hit a mine, it's not an immediate game over. It's a shame though, that instead of having randomly generated map, you only have 10 premade levels to play. But the lack of randomly generated levels is not the only bummer I have to address. The audio in this game, is practically nonexistent. Swinging/Switching your pickaxes, the teleporter hum, explosions, these are practically the only sounds in this game, and it's a bit lackluster. Also, there is no indication of whenever you win. Seriously, in the first level, I've checked the only mine there was, and nothing happened! How am I supposed to know whenever I get rid of all mines in the area?! Overall, this game could be very good, but it feels a bit incomplete. Although, if the features/changes/promises on your kickstarter campaign were to be executed, the current flaws would definitely be solved, and maybe, this could turn into a very good game! But, for now, I give this game a 3 star rating. Don't get me wrong, it's not bad, but it definitely needs some work. Nice mix and use of the theme, I'll comment based on my experience with version 1.0 (since I don't know if version 1.1 is a post-jam release, which could be due to the tutorial addition, and the improvements on the UI and the jumping mechanic). But excuse me if I'm wrong. It was hard to understand what I was doing at the beginning because of the teleportation machine. I liked to have lives because it allowed me to take risks to learn the rules of the game. I saw one can jump on the numbers, but I couldn't use that to get to the top of the cubes, which would have been useful to mark 4s and 3s. I liked the visual style of the game, more than all the main menu, and I missed it didn't have background music. Although the idea is interesting, I asked myself why you didn't use the third plane of the 3D view to re-design minesweeper, that could produce some exceptional rules to develop. Even so, I had a good experience playing it, and I hope you can reach the goal on your Kickstarter campaign. Finally, thanks four your comment in our game. Thanks for your feedback! Using the third plane could be an interesting way to increase difficulty as the player progresses, or for it to be an option for randomly generated levels. Definitely taking note of that. Awesome, thank you! It's not in the help menu but you can also jump on mines, look around and get to the other side. :) Thank you for playing. Did you make this game alone? Yes I did, a few hours after work every weekday and several hours every weekend :). Thanks for you trying it! Really nice idea and cool graphics, I really like the look of the pickaxes. AWESOME!!! Here and there a bit of polishing is missing but overall it has a lot of potential!!! 3 difficulty settings and procedurally generated fields should be enough. Found it strange that you can go to the next level without clearing the current one but like i said: Awesome Idea. Also love the minimalistic neon-graphics!!! Unfortunately, there is no music. Oh wow, thank you. A full version of the game is scheduled to be on steam for April of 2019. I will contact you for the soundtrack! I just saw that Itch.io has no message system. Great art, great theme interpretation and a very innovative concept, congratulations ! I challenge you to a dance contest on synthwave music. Fun concept that works really well for the theme! Looks great and plays well too. Thank you for trying it!